December 9, 2013 July 21, 2018 P.O.P. In the first installment in this series, we discussed what we have termed The Chicago Gambit, named after the city most often used as an example, at least for the time being. The Chicago Gambit entails cherry picking data to make the case that stricter gun laws cause an increase in crime, or at least in homicide. Now we take a look at the flipside of this tactic: the argument that liberalizing gun laws results in general crime and/or homicide decline. The gun culture also has a favorite target for this approach: a large and very influential city that has been very much in the crosshairs of the legal battle over firearm legislation. Namely, the nation’s capital. In 1976, Washington, D.C. passed The Firearms Control Regulations Act of 1975, which placed severe restrictions on the private ownership of firearms in the city. It did not, as is often claimed, ban guns altogether, though it did make the possession of handguns illegal. Then in 2008, the “conservative” Supreme Court overturned that law by giving the Second Amendment a major overhaul — decreeing among other things that the prefatory clause explaining the purpose of the amendment is really just garnish, and can be ignored. And what happened after that? Well, let’s turn again to JustFacts.com, which has some really handy facts about “gun control” in an easy-to-read visual format. Here is its graph of the homicide trend in D.C., with the point of the court’s ruling marked by the second red dot. Unfortunately for JustFacts, this chart duplicates the blunder that so many pro-gun propagandists commit: including too much information for their own good, and thus sabotaging their own argument. Yes, the chart shows a sharp murder decline after the strict gun law was overturned. But it shows that the same sharp decline already had been in progress for several years before the ruling. It started falling off abruptly after an extremely sharp spike during the city’s particularly severe crack epidemic; and neither the spike nor the drop appears to be related to any change in gun laws. Claiming it does is rather like having a boat pull you through the water on a rope for 95 yards, then letting go and coasting for 5 more yards, then asserting you just swam 100 yards. Furthermore, homicide has been falling nationwide in recent years, so D.C. was not bucking a trend. JustFacts also, like many pro-gun propagandists, omits certain facts that are not supportive of its cause. For example, there is the fact that the city of Washington has undertaken enhanced crime-fighting measures to which officials attribute the drop in homicides. Or that improved trauma care has helped reduce murder rates across the nation even though far more people are getting shot. Or that the D.C. homicide rate is very much on the rise again this year. That’s a very short term trend at this point; but the gun culture loves to cite short term trends or isolated quirks as “proof”. Furthermore, it’s cherry picking to limit the discussion to homicide alone. Because one of the main mantras of the gun culture is “more guns, less crime”. All crime. This is founded on the belief that when citizens are armed, they make a big difference in reducing the crime rate. In other words, there are many instances of defensive gun use (DGU). And here’s where the gunsters really shoot themselves into a corner. We’ve examined the problem of accurately estimating incidences of defensive gun use several times already in these pages. See previous posts: Make My Day; Mention Gun Defense Statistics; Estimating Defensive Gun Uses Reasonably; More On Defensive Gun Use. But to save you a little time at the moment, here are the Cliff’s Notes. Gunsters frequently make very extravagant claims about the number of times per year an armed citizen uses a firearm in self defense. The numbers they cite are derived from various “studies” which are really surveys that determine how often gunsters claim such events occur. These surveys, the most frequently touted of which is the deeply flawed Kleck “study” projecting 2.5 million DGUs annually (this has become the very backbone of the Gunster Gospel), are wildly inconsistent not only with each other but with themselves. More to the point, they’re wildly inconsistent with the real world. Notice that in the story mentioned in a link above (here it is again), the homicide is of a sort that often gets classified as a DGU, even though its defensive nature is, to say the least, highly questionable. Likewise for the homicide Trayvon Martin’s killer committed. It was presumed self-defense in large part because only he survived to tell his side of the story. But it’s quite clear that he initiated the confrontation; and had he not been armed, it’s unlikely that he would have engaged in the cowboy swagger that caused it to turn violent. Whatever criteria one uses, actual statistics, though they’re almost certainly incomplete, verify only a few hundred DGUs per year, as confirmed by media reports and/or law enforcement records. Gunsters have two handy dandy responses to account for this Grand Canyon of a discrepancy. First, they insist that the vast majority of DGUs are kept secret, even though in an incident that would genuinely warrant resort to a firearm, it would be irresponsible not to report it. Second, they say that most of the incidents that are reported don’t get covered by the media, because the media are all involved in a vast left-wing conspiracy to suppress anything that promotes the gun culture — never mind that violence, crime and sensationalism are the very lifeblood of the media. (This response tends to corroborate a point I’ve made before: that contemporary gun culture dogma is founded on political fanaticism at least as much as putative “gun rights”.) They have no explanation yet for the fact that gun-friendly websites which tally DGUs collected from many sources including submissions by fans still are unable to come up with a total greater than that reported in the media. As it happens, I used Washington, D.C., for various reasons, as an illustration of the absurdity of the Kleck figure. A city with the population of Washington, particularly given its crime history, would be expected to experience about 4725 DGUs annually. Yet in scouring the pro-gun websites that collect such anecdotes of such acts, I was unable to find a single one within the previous 17 years! Whereupon some gunsters cried foul. 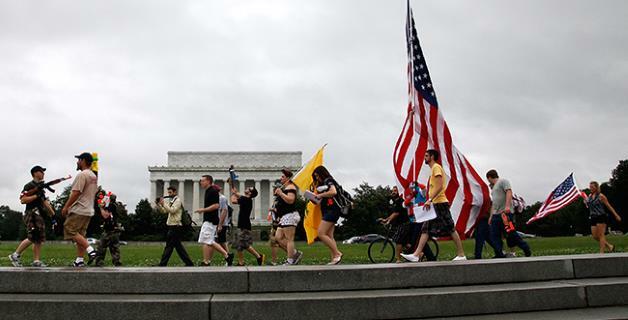 Of course there were no DGUs in D.C., they proclaimed. The gun “ban” meant that law-abiding citizens were left defenseless. One response to this response is to point out that even the NRA, which had been collecting such incidents since 1958 (18 years before the gun law was passed) had assembled only 24 DC DGUs since then — and many of those were quite questionable. But perhaps the best response is five little words: “from these cold, dead hands”. Recognize them? They were the rallying cry of the supposedly oppressed gun culture during the Heston era, and many gunsters still live by them. Never, never, never will they allow the government to “take away” their guns, they declare. But apparently, we’re to believe that this applies only to gun owners who don’t live in the nation’s capital, where gunsters so fully trust the government that they totally comply even with laws they consider an infringement on their “liberty”. My selection of D.C. as an illustrative example had nothing to do with its gun laws and much to do with its suitability as an American Everycity. Conduct the same thought experiment with any other city and you’re likely to get similar results. Furthermore, if we assume that the absence of DGUs in places with strict gun laws can be attributed to those laws, then we’d also have to assume that places with lax gun laws would have to produce much more than their statistical average in order to result in that total of 2.5 million. Which makes the utter absence of DGUs in those locations all the more striking. Still, let’s play along. Let’s say that during the time the gun law was in effect, law-abiding gunsters followed it to the letter and totally abstained from their passion for 32 years, and that accounts for the almost total absence of verifiable DGUs during that span. (We’ll just pretend those inconvenient years before the law was passed don’t even exist.) But once the Supreme Court issued its fiat, there was no reason for them not to stock up, eh? (Actually there was, but we’ll get to that in a moment.) So we should have seen a dramatic increase in DGUs during the past few years. But guess what? We haven’t. From what I can determine, the average yearly total is still just as zero as it’s always been. It appears that one or more of these things is true, at least for Washington: (a) “law-abiding” gun owners often aren’t exactly so law-abiding, but hoard guns in defiance of the law, and/or (b) the frequency of DGUs has been very, very, very, very, very overstated. As you can see from this table of crime stats for D.C., the prevailing long-term trend, beginning about 1996, is a sharp decline in overall crime. (The table is not always in precise agreement with the final figures provided by city officials, but it’s close enough to give an accurate indication of the trend.) Overall, crime dropped from a yearly average of about 65,000 to a yearly average of 35,000 to 40,000. In contrast, crime has risen during 2 of the 4 complete years since the Supreme Court’s edict (not including 2013). The average is still in that 35-40 thousand range, but it’s been ticking steadily upward; and that’s a very far cry from dropping by 4725. Note that the population of the city has increased considerably during that time, so the crime rate really hasn’t increased. But it also hasn’t decreased. Ironically, by focusing on just the drop in homicides, the gunsters overlook what is perhaps the strongest chance they have to make their case: the steep plunge in overall crime in 2009, the year after the Heller ruling. It’s their best chance, but it’s still not a very good one. The crime drop in 2009 followed a steep crime increase in 2008, the year the ruling was handed down from Mount Scalia. 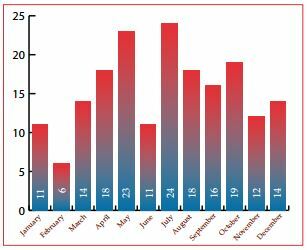 As you can see, there was an increase in killings of more than 100 percent in July, the month following the ruling. Furthermore, the second half of the year produced 113, compared to 73 during the first half. But wait a minute. Time out. Isn’t it unfair to focus on such a short-term trend? Bingo, my friend. The following month, and even the following 6 months, is too short a period to expect an accurate judgment about the impact of the ruling. So, for that matter, is the following year, and possibly even the following 6 years. Not that immediate results never can be obtained by changing the laws, but they just can’t be expected — particularly when, as here, there is good reason not to. Contrary to what the gunsters are suggesting, the Heller ruling had no immediate impact at all. The city of Washington had plenty of other measures up its sleeve to help stem the flow of hot lead in the city. Indeed, more than three years later, The Washington Times — which, as part of the late Rev. Moon’s right-wing media empire, has an interest in protecting the profits of the gun lobby — ran an article bemoaning the fact that purchasing a firearm in the city was still enormously difficult, and residents were doing so at the rate of “only” about 250 per year. Given that, it’s naive and ill-informed to expect that increased gun availability was responsible for reducing crime in 2009, only a few months after the ruling — or for generating the concurrent decline in homicide. 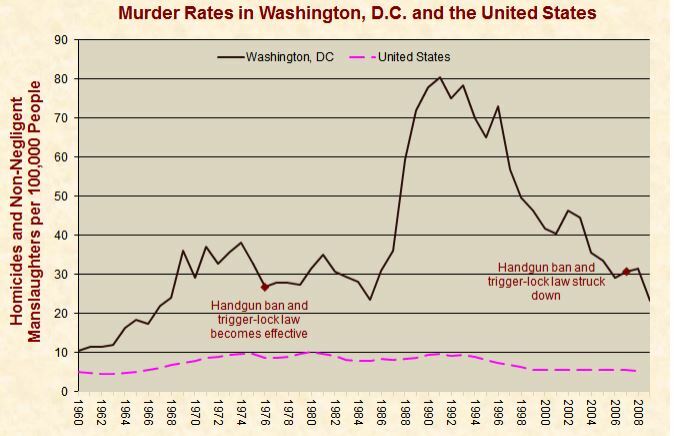 In short, it is impossible to determine from simple crime statistics alone that either the 1976 gun law or its repeal has had an effect, either positive or negative, on the D.C. crime rate or on homicide specifically. For that kind of conclusion we must turn elsewhere. For example, a 1991 study in the New England Journal of Medicine compared incidences of gun violence 10 years before and 10 years after the 1976 law went into effect, and concluded that the latter years represented a significant decrease in gun homicides and suicides in Washington, even though deaths by other means did not decline, and gun deaths did not decline in the surrounding municipalities. This doesn’t prove that the gun law was effective, but it offers evidence much more solid than the purported evidence that its repeal has been effective. I probably don’t have to tell you that gunsters have come out against this study with six-guns ablaze. Their main contention is that the period studied “conveniently” ends just before the city’s tsunami of homicide (which, as we’ve observed, was almost certainly occasioned in large part by the crack plague) even though the authors of the study address that very objection in the study itself. The gunsters’ determination to find fault with this study is hilarious, given that they’re so often eager to swallow the Kleck malarkey wholesale. And that they so often stand on the thinnest slices of cherry-picked statistics. I notice that anti gun control advocates never focus on gun control works here in Canada. We have double the number of guns per capita than the US even with a smaller population. Yet in Canada we have a 1 in 10,000 chance of having a school shooting as opposed to 1 in 500 in the US. As a Canada firearm owner myself, what Canadian laws makes a shooting less likely than in the US? Canadian, buying and selling laws make for a far less regulated environment, the background check that is required is about equal to what US states that have such laws require. Functionality of firearms legally acquirable by people are more or less the same. Or within the limit of modification needing at most a pair of pliers to bypass. And I think your statement about firearms per capital is incorrect.